John Lennon meets Yoko Ono for the first time, at the Indica Gallery in London. Eric Burdon forms The New Animals. 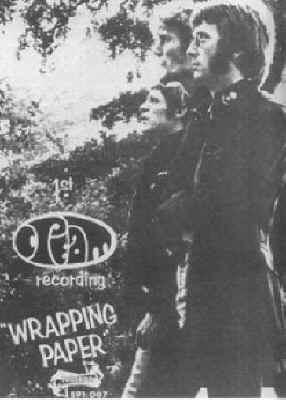 The Yardbirds film their contribution to the movie “Blow-Up” at Elstree Studios. 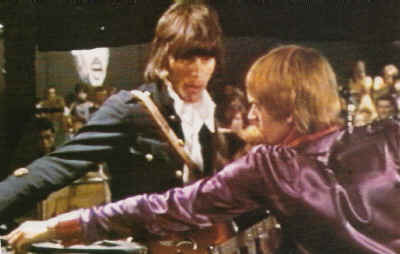 The group are shown performing ‘Stroll On’ which culminates in Jeff Beck smashing his guitar. Following this the group embark on a strenuous U.S tour (19th), however Beck quits after 2 gigs, claiming illness. The group carry on as a 4-piece with Jimmy Page the sole lead guitarist. The Troggs’ latest single, “I Can’t Control Myself” suffers “restricted airplay” by the BBC owing to ‘risque lyrics’. Vocalist/guitarist Denny Laine quits The Moody Blues. The group promptly split-up. 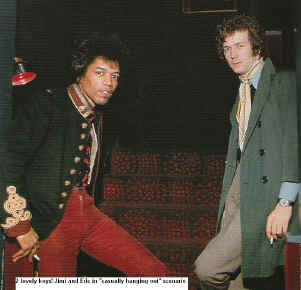 The Jimi Hendrix Experience make their concert debut, supporting Johnny Halliday at The Novelty, Evreux (13th). The Small Faces and The Hollies begin a British tour, however there is friction when Steve Marriot & Co refuse to play on the first two dates. They object to being billed below The Hollies. Meanwhile, The Hollies refuse to appear on TVs “Ready Steady Go” on the 28th when they are billed below The Dave Clark 5! Dates on the Faces/ Hollies tour were: Aldershot ABC (15th), Romford ABC (16th), Cheltenham Odeon (18th), Cardiff Capitol (19th), Taunton Gaumont (20th), Wolverhampton Gaumont (21st), Peterborough Embassy (22nd), Hull ABC (23rd), Ipswich Gaumont (24th), Northampton ABC (26th), Cambridge Regal (27th), Lincoln ABC (28th), Chester ABC (29th), Coventry Gaumont (30th) Other acts appearing on the tour include Nashville Teens and guest star Paul Jones. A benefit show at the Roundhouse for the launch of the underground paper “International Times” features Pink Floyd and The Soft Machine (15th). Paul McCartney attends, dressed as an arab. Pink Floyd also play the Roundhouse on the 31st. Eric Burdon and The New Animals tour Britain, supported by Eyes Of Blue, Chris Farlowe, Geno Washington, Georgie Fame and US guests the Paul Butterfield Blues Band. The Walker Brothers set out on tour again (1st) Support acts include The Troggs, The Montanas and The Quotations.